I have Jenga Fridge. If you pull one thing out, the whole thing topples. My mom's fridge looks the same way. Bits of salad dressing, 4 different kinds of greens wrapped up in paper towels and in various stages of disintegration, the smallest ends of cheeses, big tupperwares of cooked beans, and 13,000 different condiments. I guess this is the blight of the cook, and it must bring me some kind of security. One good problem is that I have too many veggies right now. My solution is almost always to roast them. They become so much more interesting. 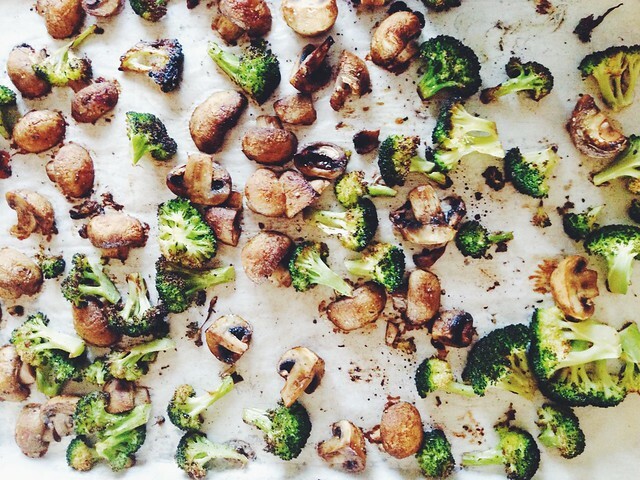 Today, it was mushrooms and broccoli, going into a salad that my friend Willow and I ate together at my kitchen table, sun streaming in. 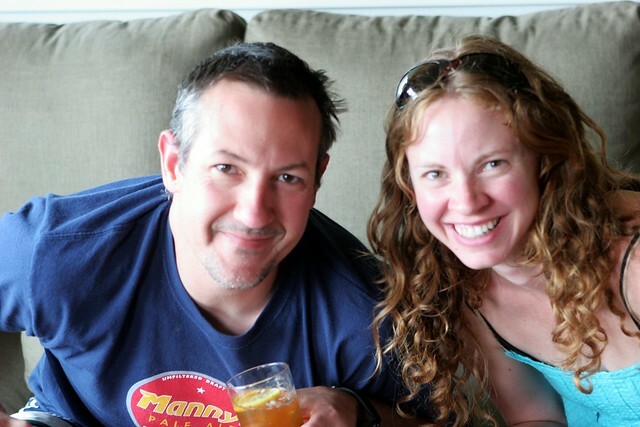 It was luxurious to take a big fat break right in the middle of the day and to cover all the topics we covered--friendship, God, kids, food, the trials of self-promotion. More and more, I'm not identifying with the "foodie" label. Yes, I love food. I like talking about it, cooking it, even shopping for it sometimes. And I know that's not necessarily normal. But what I'm really into is what happens when we slow down enough to cook something, and what happens when we are intentional enough to invite someone to share it with us. I heard someone say recently, "I find that I don't talk much anymore about what I'm doing. I talk about what I'm noticing." That describes my stance perfectly. Today, I notice the sun coming out after some epic grayness. I notice the sounds of Loretta and her friend Caleb talking and laughing. I notice that my dog has taken up residence right beside me, as usual. And I notice that I'm alive! There's a million things I'm doing imperfectly or incompletely. I notice that, too, and it's okay. To roast veggies, preheat oven to 425. Toss them with olive oil, vinegar, and salt and pepper, and lay them out in a single layer on a piece of parchment. Roast till beginning to soften and crispy in places, about 15 minutes. 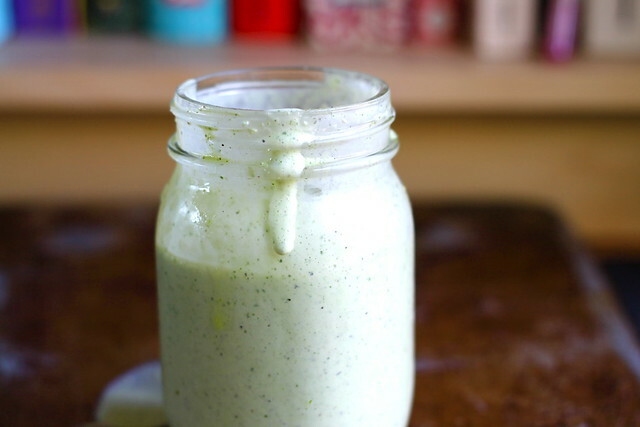 To make dressing, whisk all ingredients together, adding more of anything to taste. Toss first 5 salad ingredients together, adding cooled roasted veggies. In a couple batches, lay the salad out on a cutting board and cut all of it together so everything is a similar size. Put back in the bowl and add feta and dressing. Arrange it in 4 bowls (I use my hands.) Arrange avocado slices on top and grind a little pepper or put some more toasted sesame seeds on top. I ate this salad with 9 amazing women last week. Standing around with paper plates and maybe wiping a few tears from our eyes. The world will always need good leaders. And specifically, good managers make an incalculable difference in the lives of their employees. All the little daily things we do or don't do, say or don't say, have an even greater impact when we're in decision-making roles. We can either embrace that influence and be intentional about it or not. When we're not leading from a deep place of "okayness" with ourselves, we can do damage. We focused together on the spirituality of leadership--leading from love instead of fear, choosing awe and wonder over urgency and people-pleasing. I can't help but smile when I think about these 9 women and how much more effective and aware they've become in our time together. And how that will translate to their relationships with employees. How gifted all of us are and how listening to one another unearths those gifts. As usual, I happily took on the challenge of bringing something simple, filling, portable, and gluten-free for lunch. And I promised the recipe. Here's to you, leaders, and all the good you're unleashing in the world. This makes a huge bowl--enough for 10-12 people to have big portions. It will keep all week in the fridge, but you can also halve it. 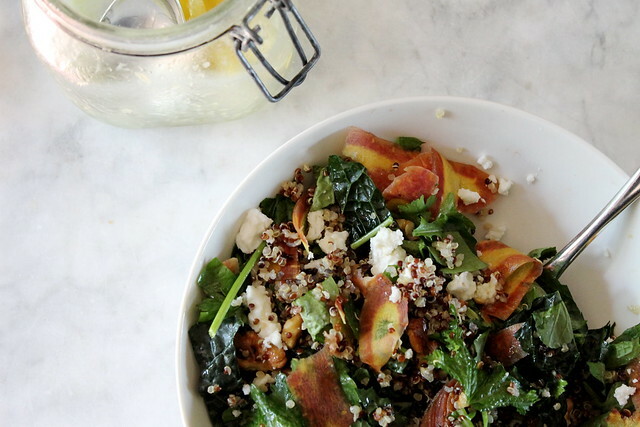 With cold grain salads like this, they are best served room temperature. If you put it in the fridge, you'll probably want to add a little more salt, lime juice, or olive oil when you pull it out as the grain will soak up everything up as it sits. If you want to add cheese to this, feta or queso fresco would be my choice. You could also serve it with diced avocado on top. Yum. You know how I feel about avocados. 8 c. cooked and cooled quinoa (1 lb. uncooked). I cook mine in the rice cooker. For dressing, combine everything but onions in a large measuring cup or bowl. Whisk to combine, adding more of anything to taste. Add onions and let marinate while you make the rest of the salad. 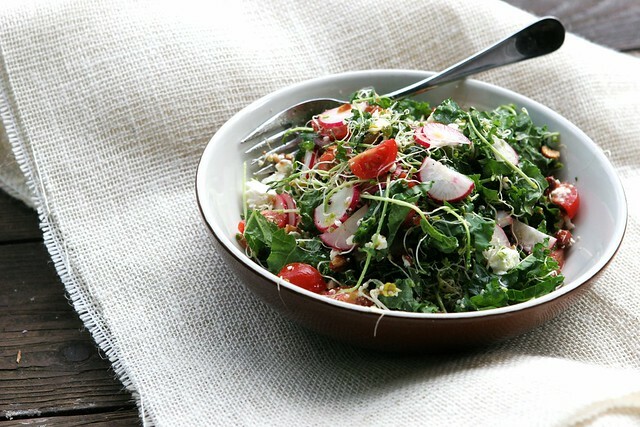 With your hands, gently combine all salad ingredients (except for sunflower seeds and herbs) in your biggest bowl. Pour dressing over, reserving a few of the marinated onions for the top. Scatter sunflower seeds and chopped fresh herbs over the top with onions. Taste again for salt. If I had t-shirts with all my slogans on them, we'd have to rent a storage unit. This week's t-shirt would say, "Put it all in one bowl!" I'm a fan of cramming as many colorful and crunchy things as possible into a bowl and then eating off it for as long as possible. 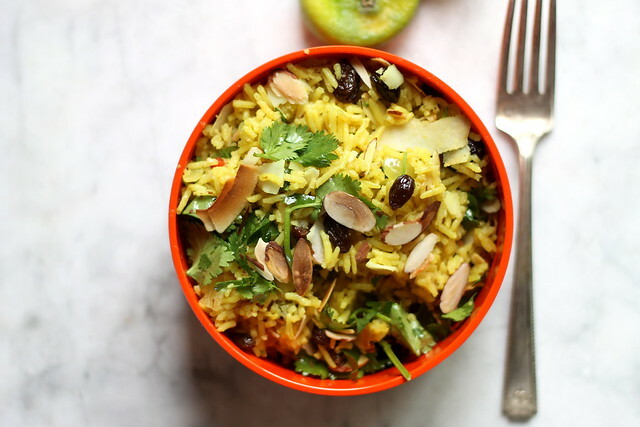 Today, it was a curried rice salad with toasted coconut and almonds, candied ginger, and veggies. I brought it to Amber's School's Out! party, and we sat on her deck drinking gin and tonics, snacking, and crying about our 5th graders moving on to middle school. Wayne, my father-in-law, couldn't believe how sentimental I got at Wyatt's 5th grade graduation. I told him that if they had these events when Yancey was 11 and they played a 6-song slideshow that included Chariots of Fire, he'd cry too. As Wyatt and Loretta get older and we all keep being present to the ups and downs of parenting, I am so, so thankful for the community of mothers in my neighborhood who help me laugh instead of cry, who watch and watch out for my kids, who remind me that my best is usually good enough. Liz, Elizabeth, Breeze, Amber, Kristen, Michelle, Debi, Kristy, Joy, Jen, Kelly, Teri, Cameo, Kate, Tracy and so many more. It's good to be together. You could add so many other things to this--chopped raw or roasted broccoli or cauliflower, shaved carrots, currants instead of raisins, Asian basil, diced red onions or chopped green onions. For rice: In a heavy medium saucepan, melt butter or coconut oil. Add onions, garlic, ginger, and curry powder and saute until melded, about 5 minutes. Add rice, 4 cups water, sugar, and raisins and stir. Bring to a boil, turn down to a simmer, cover and cook for 20 minutes. Turn off heat after 20 minutes and let sit covered for 10 minutes. Remove the lid, fluff with a fork, and pour into a big shallow salad bowl, stirring to release heat and separate the grains. To assemble the salad: Add cucumber, cilantro, mint, jalapeno, coconut, almonds, and candied ginger, saving a little of each to garnish the top. Mix with salt (keep tasting and add plenty!) and lime juice. Top with reserved ingredients. P.S. 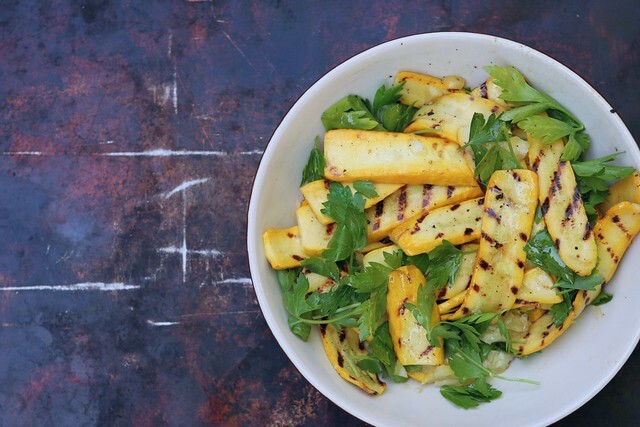 To make this heartier and serve it for dinner, grill some chicken or roast some tofu to go on top. All-Points Bulletin: Do yourself a favor and cook up some whole grains on Sunday! Brown rice, quinoa, barley, or bulgar. Stick them in the fridge and use all week--tossed into salads (my favorite), cooked on the stovetop with coconut milk in the morning and topped with toasted nuts, stirfried with veggies, or added to soups. 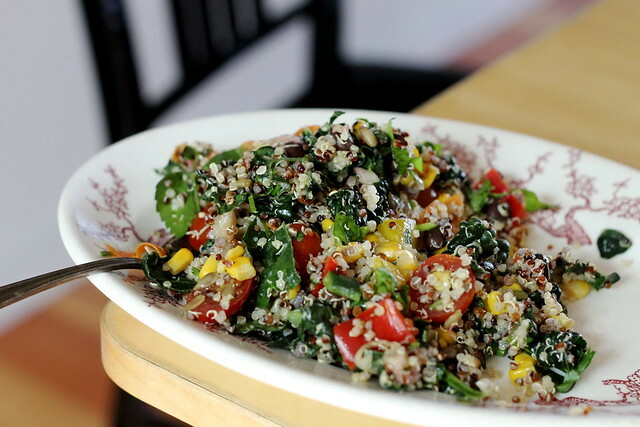 When I make "grain" salads these days, I tend to use mostly vegetables with a little bit of whole grains to help the whole thing stick together. In addition to being healthier, they're also more colorful. My friend Jordan is always begging me to be more explicit about my salads. It drives her crazy that I say, "Oh, a little of this, a little of that." So here's another one for you, Jordan. The only thing better than a working lunch at home would be lunch with you. P.S. If you're an Instragram user and are either a Seattle resident or have plans to travel there, Jordan has an instragram feed (@local_trove) that's becoming the best guide to sweet Seattle spots that I know of. Restuarants, parks, farmers markets. Beautiful photos, helpful descriptions. This serves one, but if you're serving more, just get out a big bowl and fill accordingly! 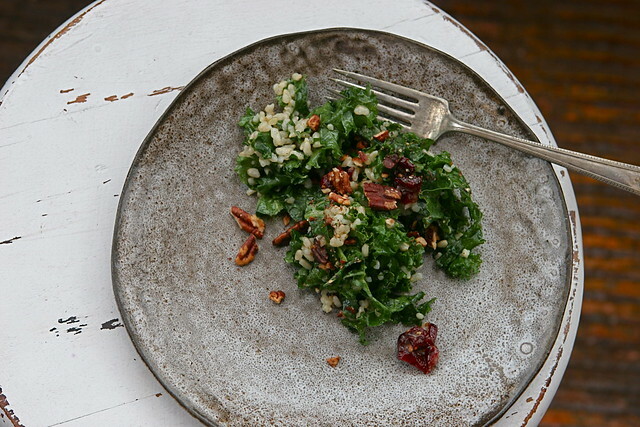 In a bowl, combine a handful of cold grains with lots of chopped kale/greens/herbs. Here, I've used black kale, mint, chives, mustard greens, Italian parlsey, and lovage from my garden. Plain old romaine would work too--you just want something with crunch (versus red or green leaf lettuce). Add a handful of toasted walnuts (or other seeds/nuts, like sunflower seeds, pepitas, or almonds), some salty feta, shaved carrots (here, red carrots shaved with a vegetable peeler) and toss with a big squeze of lemon juice, salt, pepper, and a glug of olive oil. I used juices from my preserved lemon jar, but lemon juice, olive oil, and salt are a fine substitute. Clearly, the salad resolution is easier than the others. If you know some tricks, that is. One thing I'm proud of is that my friends and family report their salads have gotten progressively tastier and more interesting as a result of being around me. A girl has to leave some sort of legacy, right? That's mine. Now that I'm sitting here thinking about it, I guess I have a lot of opinions and tips when it comes to salad. Are you ready for this? You don't need lettuce to make a salad. The one pictured here is curly kale and a couple huge handfuls of sprouts (which I'm really into right now and am growing on my kitchen counter.) No lettuce. In the winter, cabbage is often the base of my salads. It's cheap, lasts FOREVER in the fridge, and delivers a lot of nutritional bang for your buck. Purchased salad dressing is a racket. A big one. Loaded with calories, expensive, and usually not very tasty. Often, I don't mix up a salad dressing. I just toss my whole salad with a big squeeze of lemon (or lime or vinegar), coarse salt and pepper, and a glug of olive oil. Just pour them right in the bowl and mix gently and well with your hands. If you're going to make dressing, the general rule is 1 part acid to 3 parts oil, plus salt (and pepper if you're a pepper person.) Of course you can endlessly variate this--honey, apple cider vinegar, olive oil and garlic. Cilantro, sesame and vegetable oil, miso paste, and soy sauce. Find a favorite combo, make a big batch, and use it all week. A little bit of fat or protein goes a long way, especially if you make a "chopped salad" (as opposed to layered or composed.) Some finely chopped almonds, a little bit of salami,ham turkey, bacon, or tuna, 1/2 a hard-boiled egg, a bit of crumbled feta or blue cheese, a handful of canned chickpeas, or a couple minced olives or anchovies are all you need to make your salad feel like a substantial meal. You can, of course, leave these things out, but I like finding those little nuggets in the tangle of veggies. Make your salad components uniform in size. There's nothing worse than negotiating a giant chuck of carrot right next to some delicate greens. If you want chunky, make everything chunky (think Greek salad or Salad Nicoise.) A chopped salad (my favorite lately) means you can get a bite of almost everything in one forkful. It also means you're likely to eat more vegetables since they are hospitably cut. Veggie prep on the weekends makes salad-eating a lot more likely. Otherwise, you'll end up eating cheese and crackers all week. When I'm being good, I wash a few different kinds of greens and wrap them up in paper towels. Then whatever else is cheap and relatively in-season, washed and ready to go. In the winter, it's broccoli, cauliflower, red onions, green onions, radishes, hothouse cucumbers, cilantro, parsley, avocados. Nuts. And other pantry luxuries. Almost everything is a salad possibility. I'm currently into smoked almonds. When you finely chop them (you just need a few) they taste like bacon in your salad. Some other favorites: olives, pepperocini, capers, raw sunflower seeds, chia seeds, flax seeds, sun-dried tomatoes, artichoke hearts, pumpkin seeds, poppy seeds, any kind of canned beans. Be careful with fruit--canned, dried, fresh. Often it's delicious in salads, but you have to be a little more judicious with your combos. I wouldn't advise grapefruit with kidney beans, for instance. Oranges, walnuts, and red onions are a favorite combo. Or blue cheese with apples or pears and dried cherries or cranberries. Cooked grains will make you feel so proud of yourself. At the beginning of the week, cook something up--brown rice, quinoa, farro, bulgur. Drain, toss with a bit of olive oil, and refrigerate. The possibilities are endless, including tossing cold grains with whatever salad you're making. Don't limit salads to a side dish. Eat them as main dishes, and make them just for yourself. I don't mind a plate of celery or carrot sticks, but you're likely to eat a lot more vegetables if you make them interesting. What are your favorite combos? What are you planning to do in 2013 that will make you stronger and healthier? I feel two ways about potlucks. On one hand, they're the only sensible way for a big group to gather and eat together. In all my magazine-reading (have I mentioned how much I love magazines? The paper kind? ), I often come across "Easy Do-Ahead Party Menus!" that look atrocious. More work than I have ever put into having anyone over in my life. Maybe each step is technically easy, but you'd still have to be unemployed (or have a kitchen staff), hyper organized, and LOVE cooking to pull it off. So potlucks solve this problem. However, *&%$#!. Sometimes too many potlucks stack up in one week, and I find they are just as much work (or more) than what I would have made for my family that night. And I have occasionally cursed potlucks, though please don't tell anyone. Puget Sounders are supposed to love them. Always. I adore people that bring a hot, main dish to potlucks. People with crockpots (I gave mine away as it was suffering from disuse), people with those handy Rubbermaid sets with thermal jackets. If you're one of those, thank you! Keep doing your thing! It's vegan and gluten free. And I label it as such. It's filling. Though I'm not a Main Dish Super Hero (God bless you! ), it's conceivable that someone could eat a **#load of this and feel fairly satisfied. It is best served room temperature (Potluck Royalty!). It can sit in its vinaigrette forever and just get better. You don't have to worry about it getting soggy. It looks bright and beautiful with the macerated cranberries and the green kale. There's never any left. Happy Week of Giving Thanks. As always, I'm thankful for you. You could use white rice, barley, quinoa...so many other grains here. The important thing is that it's had a chance to cool down a little bit so the grains can separate. If you can't cook it ahead of time and chill it, just spread it out in a very shallow layer, drizzle a little bit of olive oil over it, and stir it occasionally to release the steam. Combine honey, salt and pepper, garlic, vinegar, and olive oil with an immersion blender. (Or with a whisk if you use a garlic press.) Add more of anything to taste. Drop the sliced onions and dried cranberries into the dressing to marinate. In a large bowl, combine rice, kale, and dressing. I use my hands. Make sure everything is covered with the vinaigrette. That's what makes this salad. Scatter the toasted pecans over the top and maybe a little more coarse salt and pepper. I'm serious. It's a blazing 72 degrees in Bellingham. I always joke that when the sun is out in The Ham, it's like you just handed everyone a $100 bill. People are so stinking happy. Yancey is home recovering from knee surgery, and we're happy, too. The surgery went without a hitch, it was overdue, and he's mending nicely. And we've had the strangest couple days--just hanging out, doing puzzles (him, not me--I have ZERO attention span for puzzles), lolling about with the kids, family dropping by to bring food or say hello. I can't resist philosophizing here--it's too bad it takes a surgery for an unplanned weekend! We're pretty good about saying "NO!" to things, but still. I resolve to do LESS in the future. It's pretty great. Yancey's sister Kelly is here today kicking #%$ on the puzzle. Look at this sweet photo. The biggest news around here might be that Wyatt is now riding around the neighborhood on his bike. Alone. And the shoes I just bought him are a size SIX. Get out. He is suddenly giant, witty, independent, and more engaging than ever. He took his bike out this morning and went garage saleing with his allowance. He bought a puzzle and a foot massager. He would grimace at me calling him cute, but God. He's cute. And mine. That is what's so crazy. He came from me. I suppose I should get around to the food here. This site was down for a week (please say you noticed!) because of some technical glitches, and I'm all chatty now that it's up again. Sometimes I think, "Maybe In Praise of Leftovers has run its course." Then things happen to change my mind. Like it disappearing and me missing it. Or Jenny and Dusty bringing me cocoa nib shortbread from The Breadfarm and writing me a card about how much iPol has meant to them. Or Janie sending me an email and saying it's made her gluten intolerance so much more bearable. Or Emily saying, "Where did it go? It's a community service!" Ah. Happy to oblige. Okay. Really getting around to the food now. Our new thing around here is salad bar. I cook, chop, and whisk some things, set them in the middle of the table, and wash a lot of dishes at the end. If you're into One Pot Meals, this probably isn't your thing. My Mom and I have always been into Thousand Pot Meals. Ask our husbands. There are going to be so many salads this summer that I can't see myself recording every single "recipe" or proportion. (Okay. I can see it. I just don't want to.) The great thing about salads is they're pretty hard to screw up. So I've decided to give myself a break and just post the ingredients, and by the end of the summer, you'll have lots of good ideas and you'll be proud of yourself for winging it. Set everything out and let the fam or guests assemble their own. Mysteriously diappear when it's time to clean all the bowls. How I adore my home office. Happy Summer, friends. I like being here with you. When I got home from my retreat last week, the fridge was bare. The kids and I had to go out for breakfast on Sunday morning for lack of fruit, bread, milk, or eggs. Amazing! Monday I could hardly close the fridge! Once the grocery shopping is done, I often spend a good 2 hours in the kitchen--cleaning the fridge, consolidating boxes of crackers, freezing overly ripe bananas for smoothies, and washing veggies for the week. If I don't make time for this task (which, crazily, I actually LIKE), I am sure to be frustrated and impulse-eating by Wednesday. A giant bunch of unwashed kale taking up a whole shelf in the fridge isn't nearly as likely to be sauteed with eggs in the morning as a neat like bag of washed and chopped kale. I overestimate myself if I think otherwise. This week, I cut up a cantaloupe and a pineapple. I washed two big bunches of cilantro and a head of lettuce, roasted a head of cauliflower, made a big batch of brown rice, and rescued half a head of radicchio that looked past its prime but actually just needed a little trimming. 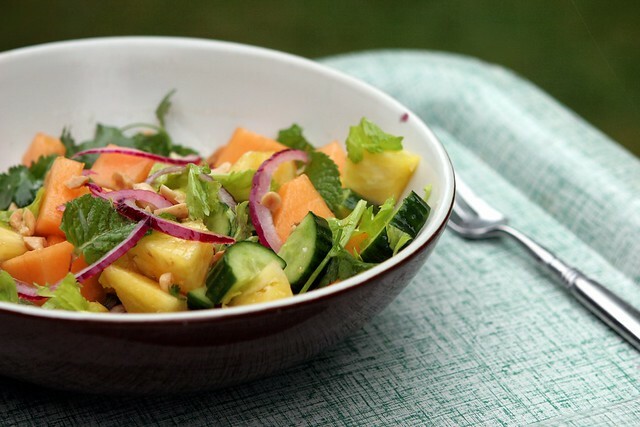 Gently combine about 1 c. each of thickly sliced cucumber, pineapple, and cantaloupe in a medium bowl. Add a good portion of cilantro (I used stems and all), mint leaves, celery leaves, thinly sliced red onion, and fresh chile if you wish. Add 1 Tb. sugar, a good jigger of fish sauce, salt, juice from half a lime, and about 1 Tb. of sesame oil. Combine gently with your hands, and scatter chopped salted peanuts over the top. Serves 1 famished Household Coordinator or 2 more petite eaters. Eyeball it for a crowd. This one is for Emily. Apparently it's possible for someone to love kale more than I do. We met her for lunch yesterday at Skillet Diner. We split lunch, and she wisely chose the Kale Caesar instead of fries as our side. I was a little wistful--I've said no to fries maybe one other time in my life. But love demands sacrfice, so I went along. I'm tracking my calories lately, and apparently a plateful of this salad will deliver over 800% of your daily vitamin A. I know you don't need that fact to entice you, though. P.S. I want this t-shirt. Kind of a friendly way to get up on one of my soapboxes? To make dressing, put all ingredients into a beaker and stick your immersion blender in there. (Or use a food processor.) Add more of anything to taste or thin with a little water if it's too thick. 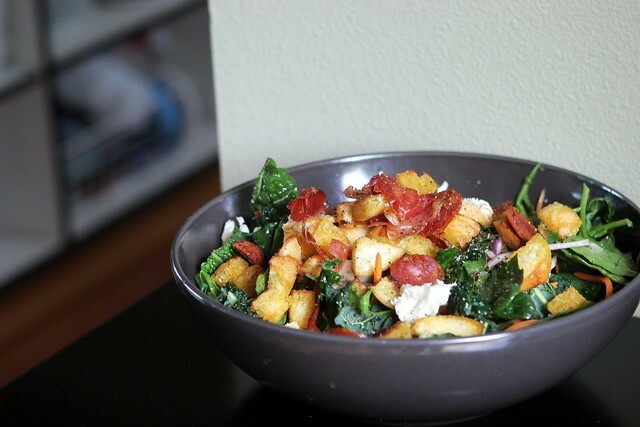 To make croutons, heat a castiron griddle or pan over medium-high heat. Brush bread with olive oil and fry until golden brown on both sides. Cut into cubes. 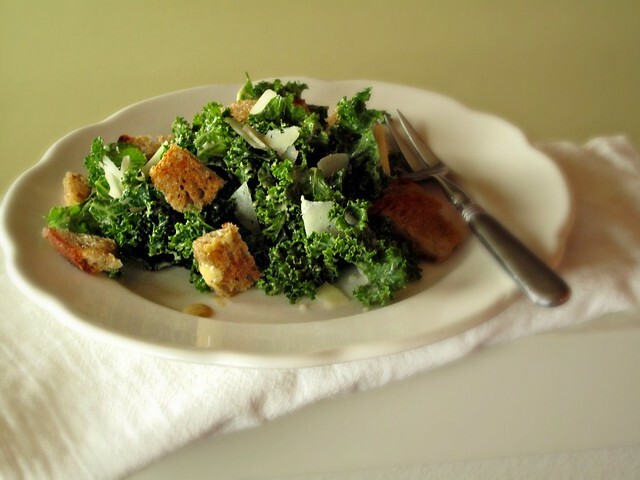 Toss kale with croutons, cheese and dressing (maybe not all of it), saving a bit of everything for the top.